As I announced February 12th, I'm going to Rwanda for the first time in late March. On my trip around the world, I spent a few months in southern Africa, and a few weeks in Egypt, but I purposefully chose to leave the adventures of the countries in between for a future adventure. For the record, all of the in-country expenses will be paid for by the country's tourism bureau, including accommodation, food, transport, tours, and permits. In exchange, while they have no expectations of me regarding coverage, I intend to do what I do best – write about my experiences on this blog, and spread the word via social media. While I'll be responsible for incidentals like alcohol and souvenirs, the big expense on my end is the roundtrip airfare. Before I could accept the trip, I searched online to ensure I could cover the flight myself. Since Jen from Kayak had recently introduced herself to me on Twitter, I decided to give them a try. In the past, I've used Orbitz to search for and book airfare, and Air Ninja to scout out routes flown by discount airlines. On Kayak, I did a quick search from Dulles, Virginia to Kigali, Rwanda, and found the cheapest option to be about $1,500 on Ethiopian Airlines. The next cheapest listing was a whole $500 higher, so I jumped over to Ethiopian Airlines' site, and played around with the dates. $1,477.00 was the going rate, and it was just about as much as I was willing to spend. It is by far the most expensive flight I've ever booked. Seriously, I don't hand over that much money to anyone but my dentist, and even that is begrudgingly. But I already knew from the occasional glimpses at adventure tour company catalogs that such a trip as I was taking would normally cost three times as much. The permit to see the endangered mountain gorillas alone is $500. I booked the flight, which initially appeared to have one stopover in Addis Ababa, Ethiopia, which made sense, only to find that there are actually 3 stopovers! …and then the exact reverse for the return flight. 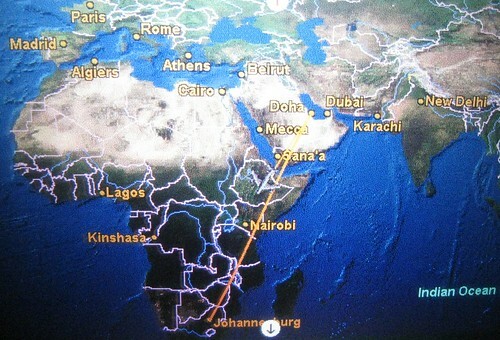 I also made sure to Google Ethiopian Airlines to get a feel for their safety record. Remember that plane that went down off the coast of Lebanon January 25,2010? Yes, that was Ethiopian Airlines. Suddenly, I felt like I was going to be taking a ride on the Lunatic Express a lot sooner than I expected. Good luck and stay safe Dave, we'll be following along with your updates for this exciting trip! Thanks Phil – appreciate your continued support! Sounds like a great deal, I'm sure you'll do a great job covering the culture of Rwanda. Do you know a lot about the culture there yet? Beyond an awareness of the genocide (going back to when I saw it on the news in '94) and mountain gorillas, I'm unfamiliar with Rwandan culture. I have plans to watch a few movies (including Gorillas in the Mist) before leaving, and pick up a book to read during the trip. I find it much more meaningful to read about a country while I'm actually in it, then to do so in advance.